The National Board and AOH National Immigration Committee created an initiative to promote the Irish Perspective on Comprehensive Immigration Reform and the month of March as Irish American Heritage Month. Beginning in March 2014, we ask Congress to recognize the important historical role of the Irish throughout US history, and show its commitment to Comprehensive Immigration Reform by wearing an AOH Irish American Heritage Month/Immigration Lapel Pin. The pins are presented to members of Congress with an accompanying card stating: “In March, designated Irish-American Heritage Month since 1991, we honor the vast contributions and sacrifice of Irish immigrants and their descendants to our Nation since its inception. Today, Irish men and women seek legal means to carry on that tradition, to live and work here, to share their technical expertise and rich culture, and as those who came before, freshen American diversity. 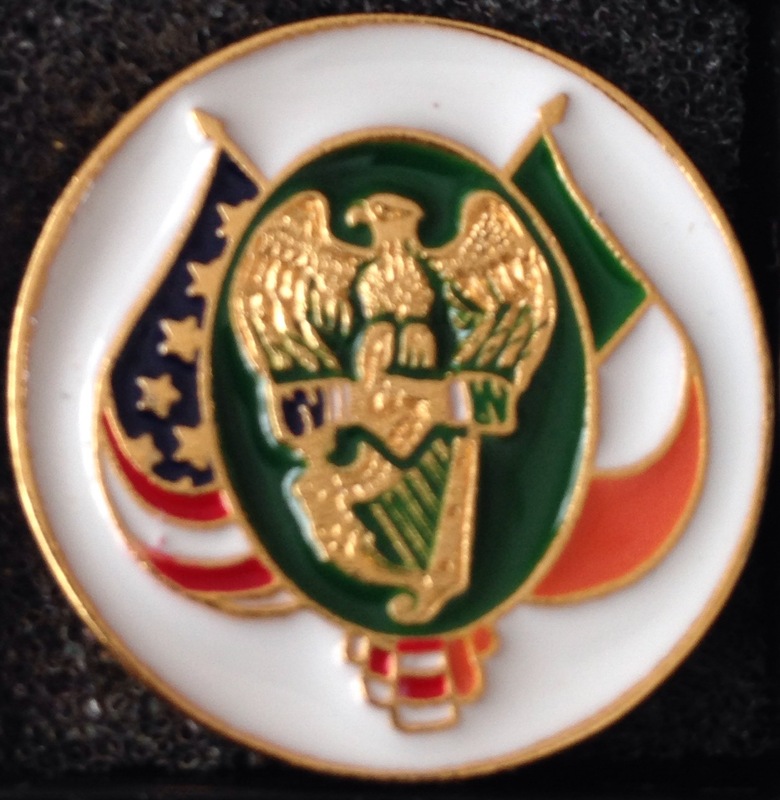 A lapel pin was used in a similar fashion in 1986 to demonstrate the need for a special US envoy for Ireland. Working with Bobby Mahoney, Virginia AOH Immigration Chair and other recently appointed State AOH Immigration Chairs, Mike Delaney (DC) and Mike Mellett (MD) the concept took form. Maryland AOH member Patrick Harnett, the artist who designed our recent Commodore Barry Memorial Dedication invitations, has come up with a design based on the Thomas Addis Emmet memorial obelisk. The pins are hand designed and made in the Rhode Island thanks to a vendor supplied by National Director Chip McLean. 1,000 limited edition pins were commissioned, distributed and an additional 535 will be presented to each member of Congress and the Executive Branch. The crest is an American Eagle and Irish Harp joined by the hands of friendship bordered by US and Irish flags. This iconic image is found on a memorial obelisk for Thomas Addis Emmet, whose 250th Birthday we remember in April, 2014. The obelisk stands in St. Paul’s Church on Broadway, in the shadows of the World Trade Center site in Lower Manhattan. Thomas Addis Emmet personifies the Irish immigrant and US success story. Born in Cork City, elder brother of martyred, Robert Emmett. Thomas was a Trinity College Dublin medical scholar, lawyer, a leader of United Irishmen along with Theobold Wolfe Tone. For his lead role in the 1798 Rebellion, imprisoned in Kilmainham Gaol. The Kilmainham Treaty offered the 1789 rebel banishment to a nation on peaceful terms with Britain and he chose the US. counselor of New York,” according to US Supreme Court Justice Joseph Story. The 33 foot high obelisk in St. Paul’s Church stands in the shadow of the Freedom Tower, and is not Emmet’s grave but a tribute from a grateful city. He shares that honor with an obelisk dedicated to hid lifelong friend and fellow United Irishman, William James MacNeven, renowned surgeon who could not receive his education in Ireland because of his Catholic faith. Emmet was buried in St. Marks Cemetery in the Bowery. He remains a hero of two nations. On the obelisk, Emmet’s United Irishmen Harp, now the National Emblem of Ireland, was brought together by the hands of friendship with the emblem of our Nation, the American Eagle. It is fitting that this AOH forged emblem respectfully borrowed from our past be used to demonstrate our current commitment to this effort. We are grateful our friends in Immigration Reform joined this poignant and truly grass-roots community effort to reach our legislators.